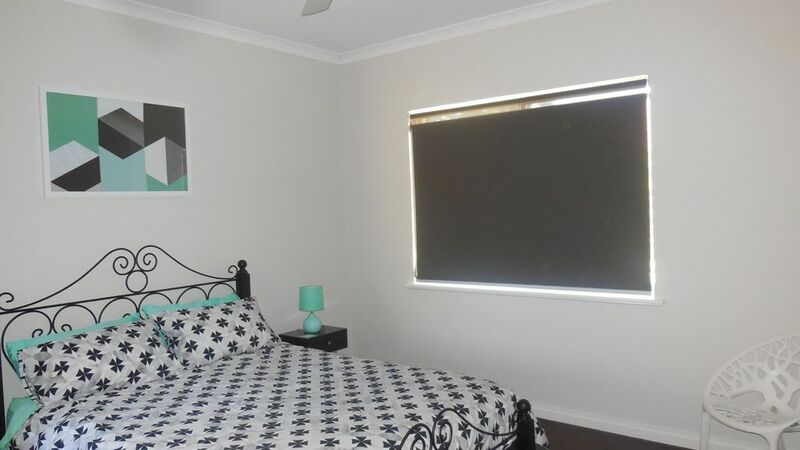 This 2 year old home set in a quiet street is in an ideal location for visitors to Perth for holidays, business or relocation. Myself ( John) and my darling wife Sandy are only a phone call away for any advice or issues that may arise. We have equipped the house with everything needed for a hassle free stay. It's close to beaches, shops and Perth. Below are listed the 4 closest shopping centres. * Gwelup Shopping Centre on North Beach Road within walking distance. It has a Farmer Jacks super market selling fresh fruit, fish and groceries, a cafe, newsagent, hairdresser, massage - beauty parlour, ladies fashion boutique and some smaller shops. * Morris Place Shops. This is an older style group of shops set around a big shady car park. There you can find a grocery shop, an op shop Chinese Restaurant and some smaller shops. Also here is the closest Hotel called "The Saint" good for a cold beer or a great pub meal. *Innaloo Shopping Centre: This is a huge shopping complex spread over a large area with every shop you could imagine including a cinema, K mart and Target. *Karrinyup Shopping centre: It's just up on Karrinyup Road not far from the house. Karrinyup has Myer, David Jones and lot of specialty shops, clothing, sporting and a food hall. * Beaches, so close and what a variety: Scarborough, Trigg, Hillarys Marina ( well worth a visit ) Mettams Pool ( good snorkeling ) and Sorrento Beach which beach has a shark proof enclosure for anyone concerned about sharks plus kilometers and kilometers of beautiful coast line. * In less than an hour's drive you can be at the old port town of Fremantle or the beautiful wine region of the Swan Valley or on the open road to visit one of our country towns. Towns like York, Toodyay, Margaret River, Busselton and New Norcia ( one of the oldest monastic towns in the world ) just to mention a few. Choose this villa or 1 of their other 2 villa because we care and we strive to make your stay fantastic, just read our reviews. Multicultural Perth city centre is only 15 minutes away by car. Northbridge, Yagan's Square and Elizabeth Quay are all interesting places to visit. Fremantle is a smaller port city worth a day trip. Yes we are near the Indian Ocean only 5 minutes drive. Many beaches, some suited for surf others snorkeling with reefs, quiet ones for children and elderly. A busy marina with shopping and dining. The Swan Valley is only 30 minutes away with many activities to do. Many wineries each with specialty menus, chocolate factory, nougat factory boutique breweries, roadside fruit and vegetable vendors. We recommend visiting Scarborough beachfront for varied dining experiences. Seafood, Burgers, Pizza, Icecreams, Coffee, A-la-carte, Fine dining, Bars, and Many restaurants. Also has a swimming pool. We have many golf courses close by. We have a set of clubs you are welcome to borrow. Hamersley public golf course is the closest. We are also close to Lake Karrinyup private golf course. Wembley Golf Complex is worth a visit. Great for all the family. Mini golf available and nice view from bar and restaurant. Also has a night driving practice range. We are within walking distance of Lake Gwelup, pretty area; great for a morning walk or run. Round trip walking is about 45 minutes. You can collect a coffee on your way back from Gwelup or Foodary. An ideal children's beach is Mettams Pool,, great for snorkeling. Also safe beach with no waves at Hillary's Marina, has many great food outlets and restaurants, souvenir shops too. We have a comprehensive file of local tourist attractions including trips to Rottnest Island to see the unique quokka. Our villa is located close to the beach and the city and within easy reach of all Perth has to offer.